IBISBILLS WINTER IN SMALL NUMBERS IN THE INDUS VALLEY in Ladakh. These strange shorebirds are unique in filling an almost dipper-like niche along the fast flowing mountain rivers of the Himalayas and surrounding ranges of Central Asia. Their long curved bill is used to glean invertebrates from the shallows around invariably rounded stones along the edges of rivers and streams. In fact it is difficult to find a photo of them that does not have defocused smooth limestone rocks in the background. My first were almost 20 years ago in Nepal but here they were constantly disturbed by folks extracting gravel from the riverbeds for road construction. It was nice to see them relatively undisturbed along the sacred Indus in Ladakh, prayer flags fluttering from the nearby iron bridge across it at Choglamsar. Another unique feature is their purple legs during the breeding season (apparently the legs of ibisbills change color to a crimson similar to the bill shade shortly after death!). 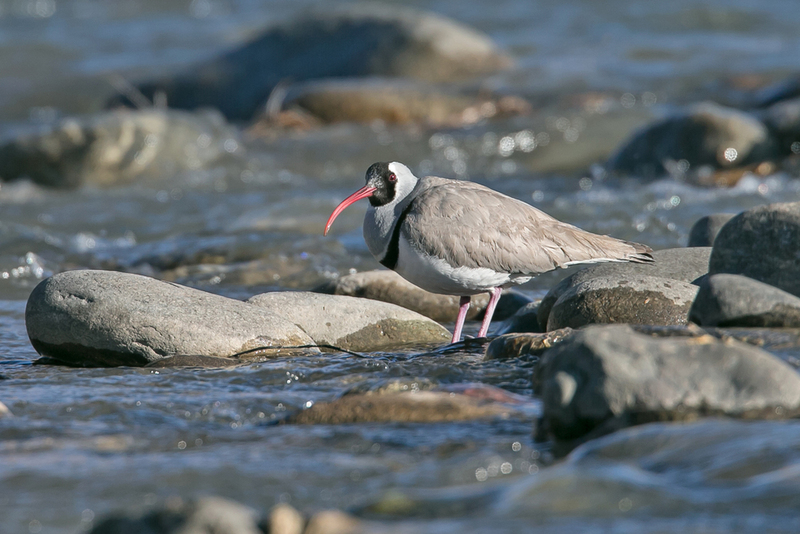 Ibisbill, Choglamsar, Ladakh - the waters of the sacred Indus turned rose gold in the evening light.